Last year November, I wrote an article to remind students and teachers alike of the importance of always maintaining and Strengthening the Balance between each other in the classroom and while at school. Teachers and students will work productively and smoothly when they treat Education in the classroom as a two-way, not one-way, process. In other words, despite what many people (especially parents who had limited schooling) may have believed in the past, or may still do, students are not sponges who merely go to school to soak up knowledge from a teacher in the classroom; neither are they clay for teachers to mold. Instead of absorbing an Education, like a sponge, a student learns under a teacher’s guidance and instruction when the student participates in the two-way process, and makes the effort to contribute his/her portion of a 50/50 endeavor. A teacher’s 50% of the two-way process (Education) includes providing students with academic expertise and guidance in the subject(s) that he/she teaches, and motivation to encourage each student in the class to want to learn about the subject introduced to the class. However, in order for learning to firmly take root, each student must provide the other all-important 50%, and act on the motivation that the teacher provides and on his/her own intrinsic motivation. Each student’s all-important 50% of the two-way process includes, paying attention and participating in class, reviewing and studying the material presented in class, and completing assignments and class projects. In addition to the academic expertise that a teacher presents in the classroom, and the oral and written academic work that each student completes, inside or outside the classroom, it is crucial that both student and teacher maintain a mutual respect for each other at all times. 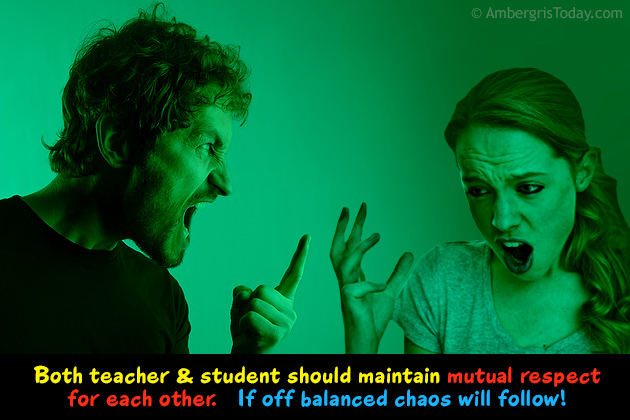 Should that fine balance of mutual respect become lopsided and off balance, chaos in the classroom will ensue. Words like discipline, obedience, power, desperation, mistrust, and fear will take on new meanings, and even become confusingly synonymous to teacher and student. Power struggles between teacher and student slowly creep into the class and replace teaching and learning. A student who loses respect for a teacher will easily become frustrated and fall into an unending struggle of trying to win power struggles. In turn, a frustrated teacher can be pulled into the same struggle. Student: You can’t make me do anything! Teacher: I’ll show you who’s in charge here! 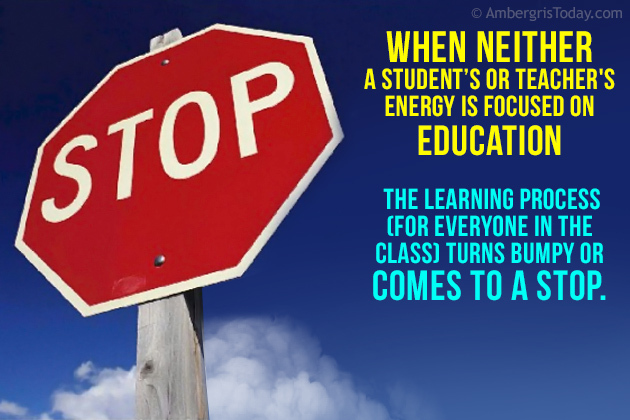 Consequently, when neither a student’s or teacher's energy is focused on Education the learning process (for everyone in the class) turns bumpy or comes to a halt. Who is to blame? Who is not providing his/her 50% responsibility? Who is not respecting whom? Whenever a student loses respect for a teacher, or vice versa, the scale tips. It’s crucial, therefore, that both sides (student and teacher) of the two-way learning process work everyday to keep and strengthen that fine but necessary balance of respect for each other. I firmly believe, and will always stress, that students should look to teachers as leaders, and always respect and follow them as leaders. Leaders, on the other hand, know when and how to take action and intervene; they know how to implement consequences. 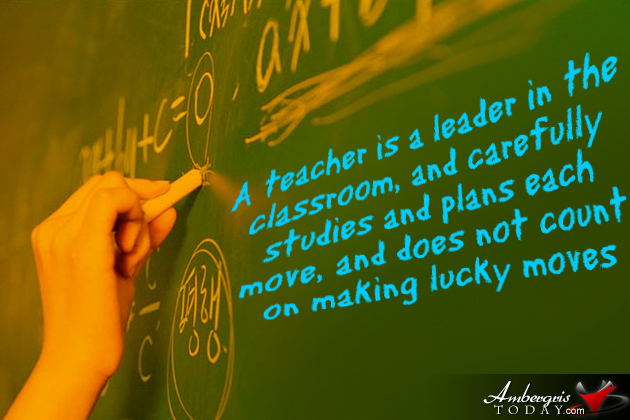 A teacher is a leader in the classroom, and carefully studies and plans each move, and does not count on making lucky moves. In addition, as a leader who wants to solidify and strengthen his/her following (classroom) of students, a teacher strives to build and develop trusting relationships with students, presents well-prepared lessons, and provides stimulating motivation to students. Having been a high school teacher since 1978, experience has shown me that what helps to maintain that delicate scale firmly balanced, not easily tipped, is taking/making the time to “listen” to students, especially those who seem lost and most in need of a leader. A teacher who is a strong leader will constantly challenge students to “work hard” and put forth their very best efforts, and not be satisfied with mediocre, careless, or below-average work. A strong leader/teacher provides an excellent role model for a student’s moral and academic development. On the other hand, a teacher whose focus is on power and authority rather than learning will often threaten, not challenge, students with lots of home/school work. (It’s no secret that parents sometimes help with very heavy loads of homework that students have.) But, do strong and effective leaders need to flaunt their power? I feel that it’s a matter of attitude. No strong leader/teacher should accept repeated excuses for poor work (or lack of) from a student; however, “no excuse” should not also close the door to seeking out solutions to help a student improve his/her participation and 50%. A teacher who threatens, more than challenges, students will quickly lose their respect, and vice versa. This, in turn, could create a class full of difficult, unmotivated, and under-performing students. 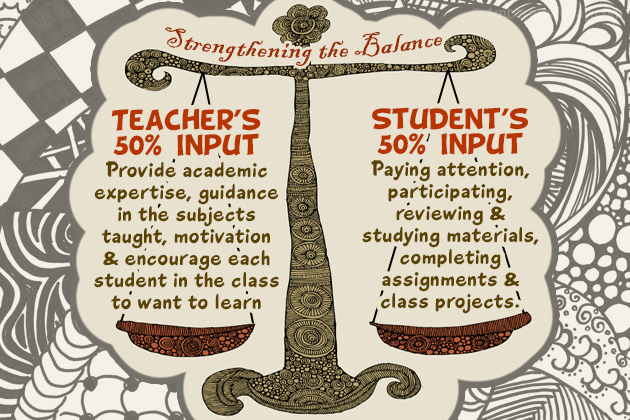 Both student and teacher, therefore, must provide his/her complete 50% effort in order to prevent that scale and delicate balance of mutual respect from tipping. Finally, and without any doubt, a student who does not provide his/her 50% of the two-way process (requirements and responsibilities in the classroom) loses the most: the ability to learn, and the ability to reach his/her potential. This student also causes the entire class to lose because constant power struggles between student and teacher can crush any incentives a teacher may have to put forth his/her best efforts to lead students in the classroom everyday. With no incentive, only a salary, a teacher may be inclined to put forth mediocre efforts to teach everyday. This leads to tension and mistrust between teacher and student, and destroys the delicate balance and appreciative relationship that keep teaching and learning smooth and successful for students and teachers. By accepting and respecting a teacher, everyday, a student strengthens the delicate balance. Students usually respect well-prepared, calm and consistent teachers over power-driven teachers who are hyper and tension-filled all the time. 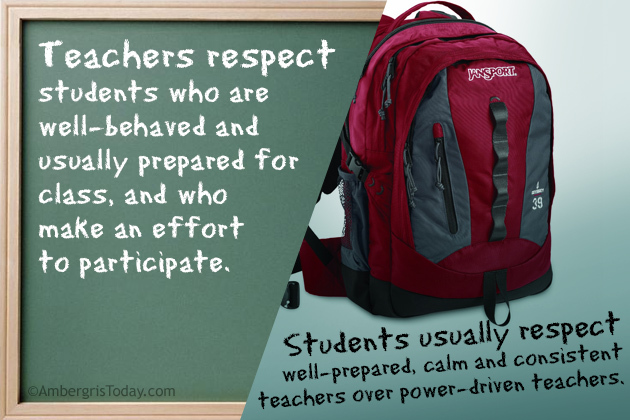 In turn, teachers respect students who are well-behaved and usually prepared for class, and who make an effort to participate in class and take cues from the teacher – not those who are the opposite.